This Dimgogo 2000w LED grow light carries awesome features to provide you with the yields you desire. 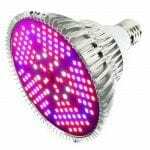 It’s yet another LED grow light with full spectrum, good coverage and a decent warranty period. 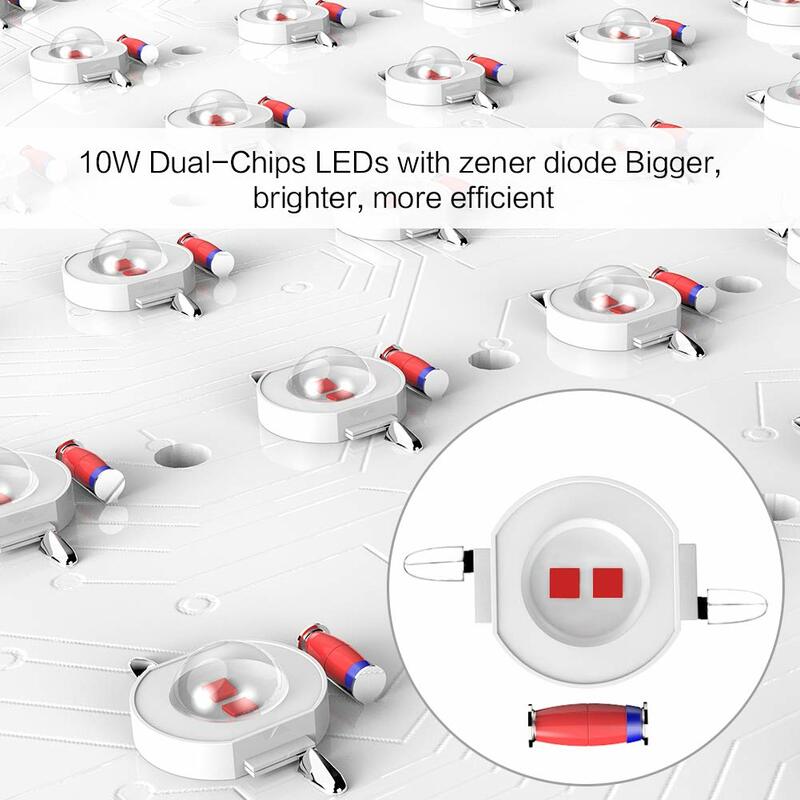 Moreover, the 10w Epileds LED double chips are not unique in the 2000w LED grow light market as well. But what is it that makes this light unique? LED grow lights are perfect to replace your old HPS or HID lights. They consume less energy, stay cooler and have a bigger lifespan. The difference with HPS/MH and HID lights is made, but this light also has some strong aspects over other LED grow lights. 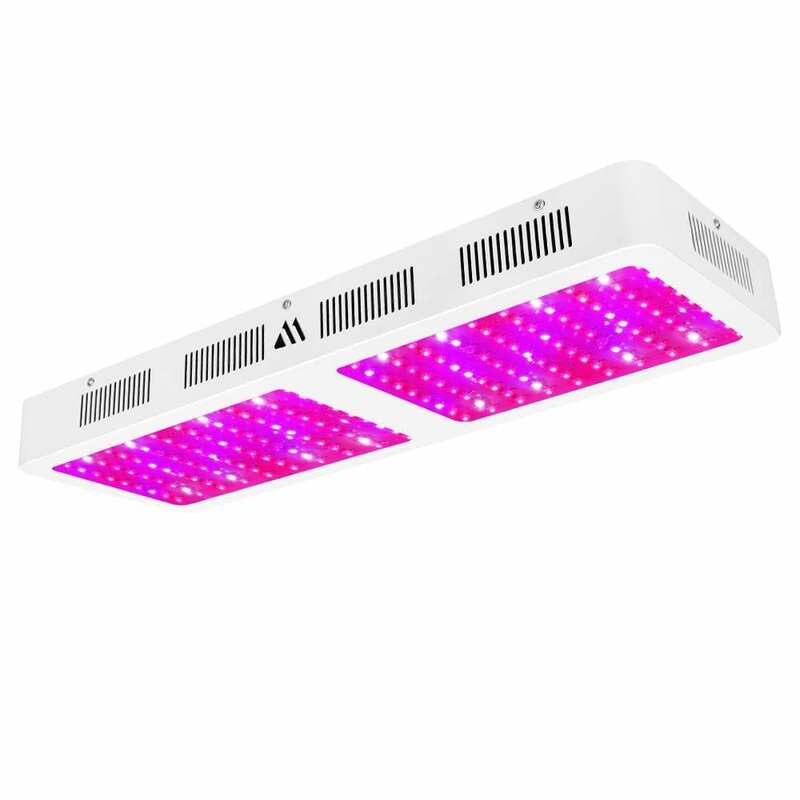 Ideal for vegetative, flowering and fruiting stages, this LED grow light holds many features. All LEDs have Zener diodes. 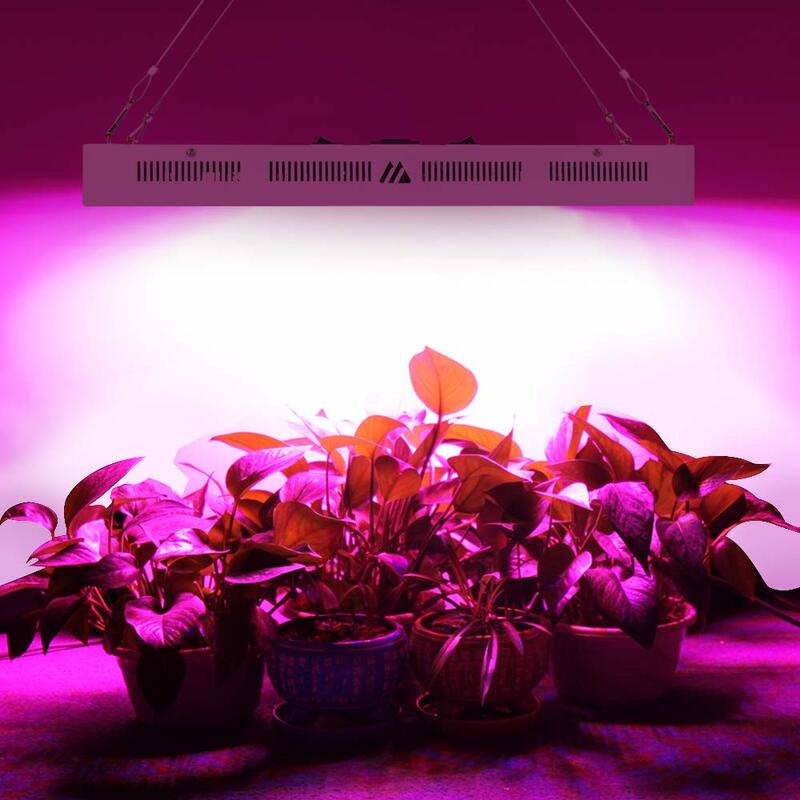 Dimgogo 2000w LED grow light is equipped with the best light features. The broader design along with the better efficiency gives a good coverage area. Moreover, Dimgogo has other amazing features that makes it one of the best choices for indoor growers. Let’s take a look at these features. Featuring the newest technology of double chips, Dimgogo 2000w LED grow light has a brighter light than most of its competitors. 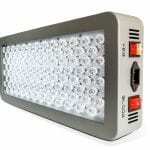 This light has 200 pieces of 10w LEDs and this makes it a powerful 2000 watt LED grow light. While consuming only 343 watt per hour, it is an energy efficient choice for all growers out there. The full spectrum of LED grows light is helpful for all the stages of plant growth. The color ratio of this LED light is similar to the essential wavelengths of sunlight. By the essential parts of sunlight, I mean that not all wavelengths of sunlight are beneficial for photosynthesis. The important wavelengths include red, blue, white, IR as well as UV. Generally, the color spectrum of the Dimgogo 2000w is ideal for germination and flowering stages. Coverage area matters a lot for LED grow lights. It determines how many plants you can grow with your fixture. The coverage area for this LED grows light is 5.5×5.5 square feet. This is a good coverage for a 2000w LED grow light, but you might want to check what your plants need. Also important is how many plants you have. You probably need a 4×8 grow tent when you use a 2000 watt LED grow light. The product is backed with 3 years of warranty as well as a 30 days money back guarantee. This is normal compared to its competitors. All in all, this is a great LED grow light for beginners that are looking for all the basic features in a safe LED grow light. The Dimgogo doesn’t have a daisy-chain function, which is a shame. But, this LED grow light meets all the standards you are looking for as a beginner. Expanding your grow room is, however, a bit harder. The cooling system coupled with bigger Zener diodes and efficiency makes it a good choice at an affordable price. Are you looking for a smaller LED grow light? 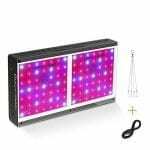 Check out the best 100 watt LED grow lights, 300 watt LED grow lights or 600 watt LED grow lights. 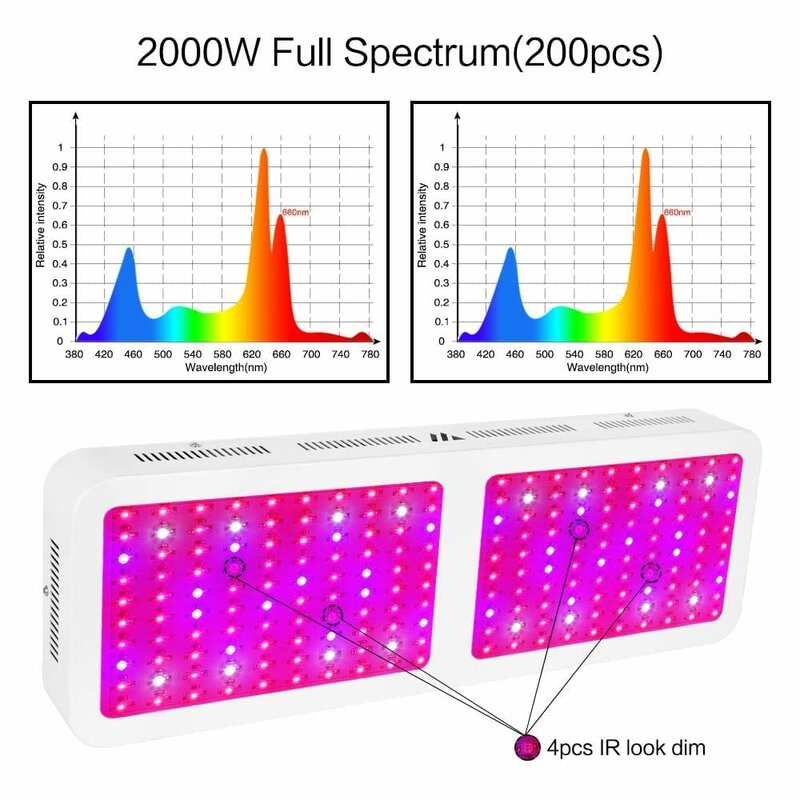 Looking for comparable 2000 watt LED grow lights? Check out the King Plus 2000w.